Completed foreclosures are down 21.7 percent year-over-year. The number of homes in some stage of foreclosure is down 16.4 percent year-over-year. There is 1.6 percent month-over-month dip in foreclosure inventory. Completed foreclosures are down 21.7 percent year-over-year and the number of homes in some stage of foreclosure is down 16.4 percent year-over-year, according to CoreLogic’s January 2016 National Foreclosure Report.
.@CoreLogic: Jan 2016 complete foreclosures are down 21.7% year-over-year. This January, 38,000 homes were a complete foreclosure, which means the home was actually lost to foreclosure. This number is down from January 2015’s 46,000 lost homes. Furthermore, the number of homes in some stage of foreclosure was 456,000, compared to 583,000 in January 2015. 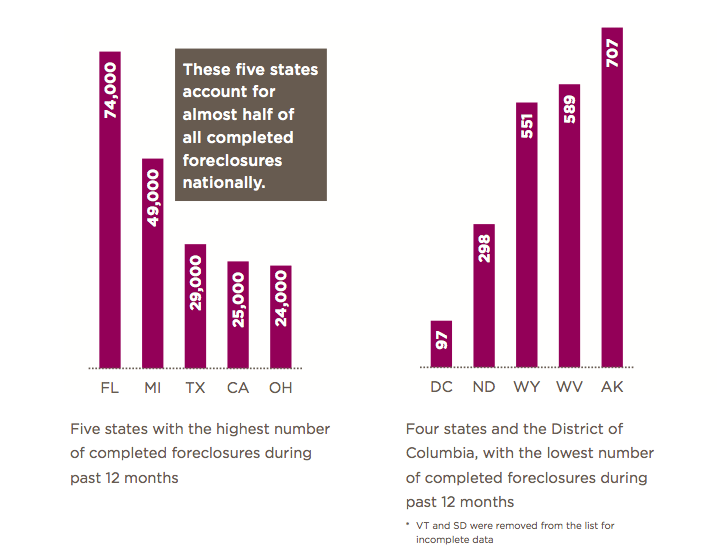 Although the national numbers are down, some states are still struggling with a high number of completed foreclosures. CoreLogic says Florida (74,000), Michigan (49,000), Texas (29,000), California (25,000) and Ohio (24,000) account for almost half of all completed foreclosures over the past year. FL, MI, TX, CA, OH lead the nation in completed foreclosures. On the other hand, the District of Columbia (97), North Dakota (298), Wyoming (551), West Virginia (589) and Alaska (707) are leading the nation in the lowest number of completed foreclosures over the same time period. In addition to the decrease in foreclosures, the company reported a 1.6 percent month-over-month dip in foreclosure inventory, which CoreLogic says is the continuation of a 51 month year-over-year decline. The nation’s foreclosure inventory has decreased by 1.2 percent. 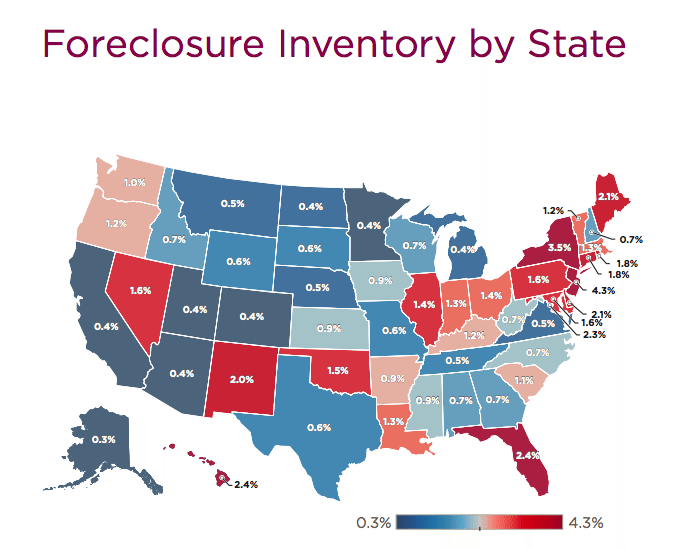 Twenty-nine states have a foreclosure inventory less than the national average of 1.2 percent. But the District of Columbia (2.3 percent), Florida (2.3 percent), Hawaii (2.4 percent), New York (3.5 percent) and New Jersey (4.3 percent) exceed the national average up to 3.1 percent.